Our latest guest post comes from Jason Manning, Director of Annual Giving at The College of Saint Rose. Jason has been with Saint Rose since 2008. **UPDATE: On November 28, 2012 the final total rased from National Philanthropy Day was announced: $22,976!! Absolutely Amazing. Thank you, Saint Rose community!! As is the case with most people, I often get asked what I do for a living. The easy answer is, “I work at The College of Saint Rose.” But when I explain that I do not teach at Saint Rose, the follow up is, “Well, what is it that you do?” My answer of, “I work in Development” or “I am a fund raiser” doesn’t really fully explain what I, and the hardworking people in my office, do on a daily basis. I like to think that my job is to work together with alumni and friends who have a shared Saint Rose experience in order to advance the mission of the College for today’s students. We do this predominately by asking for financial support of the College’s annual fund, which is called The Saint Rose Fund for Students. Gifts to The Saint Rose Fund for Students directly support student financial aid and scholarships and work toward keeping the Saint Rose experience, in the words of President David Szczerbacki, affordable and accessible to all. 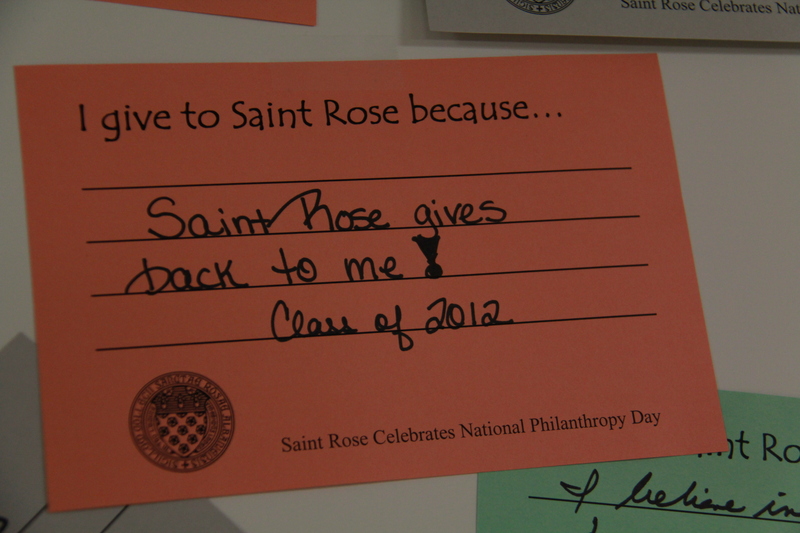 Saint Rose Celebrates National Philanthropy Day- Thursday, November 15, 2012 in the EAC main lounge. A special announcement from President Szczerbacki on our new donor leadership program called Saint Rose Students First. Recognition of Saint Rose Faculty, Staff and Administration who generously support our campus Student Emergency Fund. 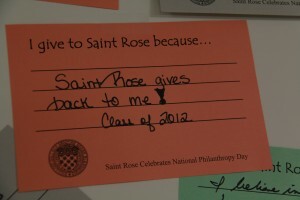 Saint Rose Fund Chair Tonita Ferradino McKone ’60, G’81’s second National Philanthropy Day $10,000 challenge to alumni! A postcard writing campaign organized by our Student Alumni Association with a message of gratitude to over 4,000 of our past donors to The Saint Rose Fund. The College’s annual Volunteer Reception which thanks those alumni and friends who have given of their time to the many initiatives and priorities of Saint Rose over the past year. And, much more! Visit the main lounge in the Events and Athletics Center from 9-5 to see what’s happening. 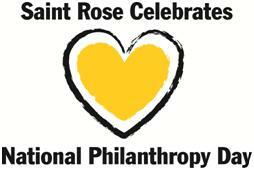 The events of this November 15 are intended to thank those who continue to make Saint Rose a charitable priority in their lives and, hopefully, engage alumni and friends and develop or rekindle relationships that will help the Office of Annual Giving continue to raise awareness and funds in support of The Saint Rose Fund for Students. There will be many communications this week to our alumni and friends via email and social media on the events of National Philanthropy Day and the success we have on the day! I hope you will follow us and consider participating! and make sure to ‘like’ the Saint Rose Office of Alumni Relations on Facebook!